This invention relates to compositions comprising certain fungal serine proteases and methods of treating a surface, preferably a textile using such compositions including the use of such compositions to clean a surface. This invention relates to cleaning and/or treatment products comprising fungal serine proteases as well as methods of cleaning and/or treating surfaces comprising compositions comprising fungal serine proteases. Detergent manufacturers incorporate proteases into their products to provide good cleaning of proteinaceous stains (such as blood). However, given the sustainability and consumer trends to lower wash temperatures it is proving increasingly difficult to deliver such consumer acceptable benefits at lower wash temperatures as current proteases have very low activity levels, for example 10% of their maximum activity, in the typical low wash temperatures of 5°C to 20°C. Thus, there remains a need to improve the cleaning and freshness profile of consumer products that will be used at low wash temperatures. Applicant has surprisingly recognized that increased cleaning and/or freshness performance is achieved using application of certain cleaning components in a concentrated form and that further, when used in this way, fungal proteases give enhanced cleaning. Thus, cleaning of proteinaceous stains is greatly improved. The performance of other cleaning ingredients may also be enhanced. For example, the performance of proteases other than the aforementioned fungal protease may be improved, lipolytic action of lipases may be enhanced, amylolytic action of amylases may be enhanced, the catalytic bleaching action of bleach catalysts may be increased, the action of chelants may be enhanced and the performance of perfume microcapsules may be improved. This invention relates to concentrated cleaning and/or treatment products comprising fungal proteases and processes for making and using such products. Such compositions provide improved cleaning and freshness. Such proteases are wild types or are derived from such wild types, by substitution, insertion and/or deletion of one or more of the parent enzymes' amino acids. The invention also comprises a method for cleaning a surface comprising a first step of contacting said surface with a concentrated cleaning composition comprising a fungal serine protease; and a second step comprising diluting said concentrated cleaning composition to contact the surface with an aqueous wash liquor. According to a preferred aspect of the invention the surface is a textile surface. Cleaning compositions are also provided comprising serine fungal proteases and polymers such as those selected from polyvinylalcohol polymers, polyethyleneimine polymers, carboxymethyl cellulose polymers. As used herein, the term "concentrated cleaning and/or treatment composition" includes, unless otherwise indicated, "heavy-duty" washing agents, especially laundry detergents; granular or powder- form, liquid, gel or paste- form all-purpose washing agents; liquid fine-fabric detergents; hand dishwashing agents or light duty dishwashing agents. High-foaming type compositions may be preferred. Alternatively machine dishwashing agents, including the various tablet, unit dose liquid tablets /pouches, impregnated non woven sheets, granular, liquid and rinse-aid types for household and institutional use; liquid cleaning and disinfecting agents, including antibacterial hand-wash types, laundry bars, car or carpet shampoos, bathroom cleaners; hair; as well as cleaning auxiliaries such as bleach additives and "stain-stick" or pre- treat types. As used herein, the phrase "is independently selected from the group consisting of " means that moieties or elements that are selected from the referenced Markush group can be the same, can be different or any mixture of elements. As used herein, articles, for example, "a" and "an" when used in a claim, are understood to mean one or more of what is claimed or described. As used herein, the terms "include", "includes" and "including" are meant to be non- limiting. Unless otherwise noted, all component or composition levels are in reference to the active level of that component or composition, and are exclusive of impurities, for example, residual solvents or by-products, which may be present in commercially available sources. Unless otherwise noted, the enzymes of the present invention are expressed in terms of active protein level and are exclusive of impurities, for example, residual solvents or byproducts, which may be present in commercially available sources. All percentages and ratios are calculated by weight unless otherwise indicated. All percentages and ratios are calculated based on the total composition unless otherwise indicated. It should be understood that every maximum numerical limitation given throughout this specification includes every lower numerical limitation, as if such lower numerical limitations were expressly written herein. Every minimum numerical limitation given throughout this specification will include every higher numerical limitation, as if such higher numerical limitations were expressly written herein. Every numerical range given throughout this specification will include every narrower numerical range that falls within such broader numerical range, as if such narrower numerical ranges were all expressly written herein. In another aspect of the invention the fungal serine protease at least 66%, 70%, 75%, 80%, 85%, 90%, 95%, 99%, or even complete identity to SEQ ID NO: 2. SEQ ID NO: 2 is the amino acid sequence of a fungal serine protease derived from Trichoderma reesei strain QM6a. In another aspect the fungal serine protease has at least 66%, 70%, 75%, 80%, 85%, 90%, 95%, 99%, or even complete identity to SEQ ID NO: 3. SEQ ID NO: 3 is the amino acid sequence of a fungal serine protease derived from Malbranchea cinnamomea strain ALK04122. In another aspect the fungal serine protease has at least 86%, 90%, 95%, 99%, or even complete identity to SEQ ID NO: 4. SEQ ID NO: 4 is the amino acid sequence of a fungal serine protease derived from Fusarium graminearum strain ALK01726. In another aspect the fungal serine protease in has at least 86%, 90%, 95%, 99%, or even complete identity to SEQ ID NO: 5. SEQ ID NO: 5 is the amino acid sequence of a fungal serine protease derived from Fusarium equiseti strain CBS 119568. In another aspect the fungal serine protease has at least 81%, 85%, 90%, 95%, 99%, or even complete identity to SEQ ID NO: 6. SEQ ID NO: 6 is the amino acid sequence of a fungal serine protease derived from Fusarium acuminatum strain CBS 124084. The fungal serine proteases can be produced using standard biochemical means. For example, a procedure for the isolation of the fungal serine protease derived from Trichoderma reesei strain QM9414 defined by SEQ ID NO: 1, is found in Example 1 of this specification. In other aspects, the fungal serine protease is a protein engineered variant of one of the six wild- type enzymes defined by SEQ ID NOS: 1-6. Protein engineered variants can be produced using standard procedures well-known to those skilled in the art. Multiple amino acid substitutions can be made and tested using known methods of mutagenesis, recombination and/or shuffling followed by a relevant screening procedure. Briefly, these methods involve simultaneously randomizing two or more positions in a polypeptide, or recombination/shuffling of different mutations followed by selecting a polypeptide for functionality, and then sequencing the mutagenized polypeptides to determine the spectrum of allowable substitutions at each position. Other methods that can be used include phage display and region- directed mutagenesis. Mutagenesis/shuffling methods as disclosed above can be combined with high-throughput, automated screening methods to detect activity of cloned, mutagenized polypeptides in host cells. Mutagenized DNA molecules that encode active polypeptides can be recovered from the host cells and rapidly sequenced using modern equipment. These methods allow the rapid determination of the importance of individual amino acid residues in a polypeptide of interest, and can be applied to polypeptides of unknown structure. Using the methods discussed above, one of ordinary skill in the art can identify and/or prepare a variety of polypeptides that are substantially homologous to the polypeptides of SEQ ID NOS: 1-6 above and retain the proteolytic activity of the wild-type protein, as detected, for example using the artificial substrate azo-casein. When producing such variants, the catalytic active site residues should be preserved, i.e. His-91, Asp-136 and Ser-234 for SEQ ID 1, although substitutions, insertions and deletions to the other regions of the polypeptide chain may be beneficial in enhancing performance of the enzyme in a cleaning and/or treatment composition. Examples of such changes are substitutions to surface residues in order to change the charge of the enzyme and hence influence its deposition onto surfaces such as textiles, skin or hard surfaces. Other changes may be beneficial in reducing the sensitivity of the enzyme to autolysis, or attack by other proteases, for example by substituting sites that are susceptible to proteolytic attack. Other changes may be beneficial in reducing the sensitivity of the enzyme to denaturation by temperature, surfactant, chelating agent or bleaching agents. an additional cleaning material is disclosed. In one aspect, said concentrated cleaning and/or treatment composition comprises, based on total composition weight, from about 0.00001% to about 2%, from about 0.0001% to about 1%, from about 0.0005% to about 1%, from about 0.001% to about 0.5% or even from about 0.002% to about 0.25% of said fungal serine protease. In one aspect of said concentrated cleaning and/or treatment composition, said additional cleaning material is selected from a polymer selected from the group comprising polyethylene imine polymers, substituted polyethylene imine polymers such as alkoxylated or preferably ethoxylated polyethyleneimine polymers, soil release polymers and dye transfer inhibitor polymers described in more detail below. Typically such polymers will be present in the concentrated cleaning and/or treatment compositions in an amount from 0.001 to 15 wt%, preferably from 0.1 to 10 wt% or 0.5 to 7 wt%. The concentrated cleaning and/or treatment composition may comprise an additional cleaning material selected from the the group consisting of surfactants, chelating agents, dye transfer inhibiting agents, dispersants, additional enzymes, and enzyme stabilizers, catalytic materials, bleaching agents, polymeric dispersing agents, clay soil removal/anti-redeposition agents, brighteners, suds suppressors, dyes, perfumes, perfume microcapsules, structure elasticizing agents, fabric softeners, carriers, hydrotropes, processing aids, solvents, pigments, hueing agents, photobleaches, structurants, and mixtures thereof. In one aspect of said concentrated cleaning and/or treatment composition, said cleaning and/or treatment composition comprises an additional enzyme. One or more preferred additional enzyme is selected from the group consisting of hemicellulases, peroxidases, proteases, cellulases, xylanases, lipases, phospholipases, perhydrolases, esterases, cutinases, pectinases, mannanases, pectate lyases, keratinases, reductases, oxidoreductases, phenoloxidases, lipoxygenases, ligninases, pullulanases, tannases, pentosanases, glucanases, arabinosidases, hyaluronidase, chondroitinase, laccase, amylases, and mixtures thereof. In one aspect of said concentrated cleaning and/or treatment composition, said additional enzyme is selected from the group consisting of: first cycle lipases; cutinases; alpha-amylases; bacterial proteases; microbial-derived endoglucanases; and mixtures thereof. In one aspect of said concentrated cleaning and/or treatment composition, said concentrated cleaning and/or treatment composition comprises a surfactant, selected from the group of: anionic surfactants selected from the group consisting of linear alkylbenzene-sulfonate (LAS), alcohol ethoxysulfate (AES), mid-branched alkyl sulfates (HSAS) and mixtures thereof; non ionic alcohol ethoxylates, amine oxides; and mixtures thereof. Perf erred surfactant mixtures comprise at least anionic and nonionic surfactant surfactant in a weight ratio from 10:1 ot 1:10 or 2:1 to 1:2 or even around 1:1.
polymers ;polyethylene imines; and mixtures thereof. combination to create a specific shade of hueing and/or to shade different fabric types. This may be provided for example by mixing a red and green-blue dye to yield a blue or violet shade. Hueing agents may be selected from any known chemical class of dye, including but not limited to acridine, anthraquinone (including polycyclic quinones), azine, azo (e.g., monoazo, disazo, trisazo, tetrakisazo, polyazo), including premetallized azo, benzodifurane and benzodifuranone, carotenoid, coumarin, cyanine, diazahemicyanine, diphenylmethane, formazan, hemicyanine, indigoids, methane, naphthalimides, naphthoquinone, nitro and nitroso, oxazine, phthalocyanine, pyrazoles, stilbene, styryl, triarylmethane, triphenylmethane, xanthenes and mixtures thereof. Suitable fabric hueing agents include dyes, dye-clay conjugates, and organic and inorganic pigments. Suitable dyes include small molecule dyes and polymeric dyes. Suitable small molecule dyes include small molecule dyes selected from the group consisting of dyes falling into the Colour Index (C.I.) classifications of Direct, Basic, Reactive or hydrolysed Reactive, Solvent or Disperse dyes for example that are classified as Blue, Violet, Red, Green or Black, and provide the desired shade either alone or in combination. In another aspect, suitable small molecule dyes include small molecule dyes selected from the group consisting of Colour Index (Society of Dyers and Colourists, Bradford, UK) numbers Direct Violet dyes such as 9, 35, 48, 51, 66, and 99, Direct Blue dyes such as 1, 71, 80 and 279, Acid Red dyes such as 17, 73, 52, 88 and 150, Acid Violet dyes such as 15, 17, 24, 43, 49 and 50, Acid Blue dyes such as 15, 17, 25, 29, 40, 45, 75, 80, 83, 90 and 113, Acid Black dyes such as 1, Basic Violet dyes such as 1, 3, 4, 10 and 35, Basic Blue dyes such as 3, 16, 22, 47, 66, 75 and 159, Disperse or Solvent dyes such as those described in EP1794275 or EP1794276, or dyes as disclosed in US 7208459 B2, and mixtures thereof. In another aspect, suitable small molecule dyes include small molecule dyes selected from the group consisting of C. I. numbers Acid Violet 17, Direct Blue 71, Direct Violet 51, Direct Blue 1, Acid Red 88, Acid Red 150, Acid Blue 29, Acid Blue 113 or mixtures thereof. carboxymethyl cellulose (CMC) covalently bound to a reactive blue, reactive violet or reactive red dye such as CMC conjugated with C.I. Reactive Blue 19, sold by Megazyme, Wicklow, Ireland under the product name AZO-CM-CELLULOSE, product code S-ACMC, alkoxylated triphenyl- methane polymeric colourants, alkoxylated thiophene polymeric colourants, and mixtures thereof. Preferred hueing dyes include the whitening agents found in WO 08/87497 Al, WO2011/011799 and WO2012/054835. Preferred hueing agents for use in the present invention may be the preferred dyes disclosed in these references, including those selected from Examples 1-42 in Table 5 of WO2011/011799. Other preferred dyes are disclosed in US 8138222. Other preferred dyes are disclosed in WO2009/069077. Suitable dye clay conjugates include dye clay conjugates selected from the group comprising at least one cationic/basic dye and a smectite clay, and mixtures thereof. In another aspect, suitable dye clay conjugates include dye clay conjugates selected from the group consisting of one cationic/basic dye selected from the group consisting of C.I. Basic Yellow 1 through 108, C.I. Basic Orange 1 through 69, C.I. Basic Red 1 through 118, C.I. Basic Violet 1 through 51, C.I. Basic Blue 1 through 164, C.I. Basic Green 1 through 14, C.I. Basic Brown 1 through 23, CI Basic Black 1 through 11 , and a clay selected from the group consisting of Montmorillonite clay, Hectorite clay, Saponite clay and mixtures thereof. In still another aspect, suitable dye clay conjugates include dye clay conjugates selected from the group consisting of: Montmorillonite Basic Blue B7 C.I. 42595 conjugate, Montmorillonite Basic Blue B9 C.I. 52015 conjugate, Montmorillonite Basic Violet V3 C.I. 42555 conjugate, Montmorillonite Basic Green Gl C.I. 42040 conjugate, Montmorillonite Basic Red Rl C.I. 45160 conjugate, Montmorillonite C.I. Basic Black 2 conjugate, Hectorite Basic Blue B7 C.I. 42595 conjugate, Hectorite Basic Blue B9 C.I. 52015 conjugate, Hectorite Basic Violet V3 C.I. 42555 conjugate, Hectorite Basic Green Gl C.I. 42040 conjugate, Hectorite Basic Red Rl C.I. 45160 conjugate, Hectorite C.I. Basic Black 2 conjugate, Saponite Basic Blue B7 C.I. 42595 conjugate, Saponite Basic Blue B9 C.I. 52015 conjugate, Saponite Basic Violet V3 C.I. 42555 conjugate, Saponite Basic Green Gl C.I. 42040 conjugate, Saponite Basic Red Rl C.I. 45160 conjugate, Saponite C.I. Basic Black 2 conjugate and mixtures thereof. 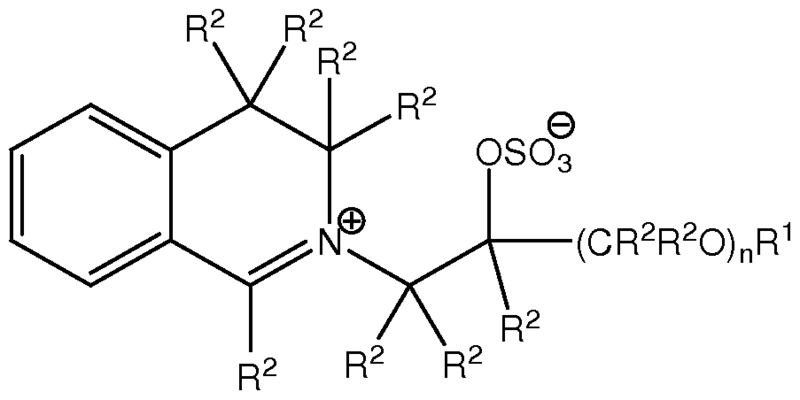 tetrabromopyranthrone, perylene-3,4,9,10-tetracarboxylic acid diimide, wherein the imide groups may be unsubstituted or substituted by C1-C3 -alkyl or a phenyl or heterocyclic radical, and wherein the phenyl and heterocyclic radicals may additionally carry substituents which do not confer solubility in water, anthrapyrimidinecarboxylic acid amides, violanthrone, isoviolanthrone, dioxazine pigments, copper phthalocyanine which may contain up to 2 chlorine atoms per molecule, polychloro-copper phthalocyanine or polybromochloro-copper phthalocyanine containing up to 14 bromine atoms per molecule and mixtures thereof. In another aspect, suitable pigments include pigments selected from the group consisting of Ultramarine Blue (C.I. Pigment Blue 29), Ultramarine Violet (C.I. Pigment Violet 15) and mixtures thereof. The aforementioned fabric hueing agents can be used in combination (any mixture of fabric hueing agents can be used). In one aspect of said concentrated cleaning and/or treatment composition, said concentrated cleaning and/or treatment composition comprises, based on total product weight, from about 0.00003% to about 0.3% hueing agent. In one aspect of said concentrated cleaning and/or treatment composition, said concentrated cleaning and/or treatment composition comprises, based on total product weight, less than 15% builder. In one aspect of said concentrated cleaning and/or treatment composition, said concentrated cleaning and/or treatment composition is a multi-compartment unit dose. In one aspect of said concentrated cleaning and/or treatment composition, said concentrated cleaning and/or treatment composition is in the form of a multi-compartment unit dose, wherein the fungal serine protease is in a different compartment to any additional enzymes and/or chelant. In one aspect of said concentrated cleaning and/or treatment composition, said concentrated cleaning and/or treatment composition is a hand dishwashing or machine dishwashing composition. In one aspect, said concentrated cleaning and/or treatment composition comprises, based on total cleaning and/or treatment composition weight, a total of no more than 20% water, a total of no more than 15% water or even a total of no more than 10% water. In one aspect, said concentrated cleaning and/or treatment composition comprises based on total cleaning and/or treatment composition weight, from about 10% to about 70%, or even from about 20% to about 60% of a water-miscible organic solvent, said water-miscible organic solvent in one aspect having a molecular weight of greater than 70 Daltons, in one aspect said water-miscible organic solvent in one aspect having a molecular weight of greater than 70 Daltons to about 1000 Daltons. In one aspect, said concentrated cleaning and/or treatment composition comprising a perfume microcapsule comprising a core and a shell that encapsulates said core, said perfume microcapsule having a D[4,3] average particle of from about 0.01 microns to about 200 microns. c) a bacterial protease selected from the group consisting of wild-type and variants of subtilisins derived from Bacillus lentus, B. alkalophilus, B. subtilis, and B. amyloliquefaciens. d) a bacterial amylase selected from the group consisting of wild-type and variants of amylase AA560 from Bacillus sp. DSM 12649, and wild-type and variants of amylase SP722 horn Bacillus sp. NCIB 12513.
i) a bleaching material selected from the group consisting of catalytic metal complexes, photobleaches, bleach activators, hydrogen peroxide, sources of hydrogen peroxide, pre-formed peracids, bleach boosters and mixtures thereof. (Novozymes), Kannase™ (Novozymes) and Properase™ (Genencor); microbial-derived endoglucanases exhibiting endo-beta-l,4-glucanase activity (E.C. 3.2.1.4), including a bacterial polypeptide endogenous to a member of the genus Bacillus which has a sequence of at least 90%, 94%, 97% and even 99% identity to SEQ ID NO:2 in US 2005/0112749 Al - such an enzyme being commercially available under the tradename Celluclean™ by Novozymes A/S, and mixtures thereof; oxidoreductases, for example oxidases such as glucose, choline or carbohydrate oxidases, oxygenases, catalases, peroxidases, like halo-, chloro-, bromo-, lignin-, glucose- or manganese-peroxidases, dioxygenases or laccases (phenoloxidases, polyphenoloxidases). 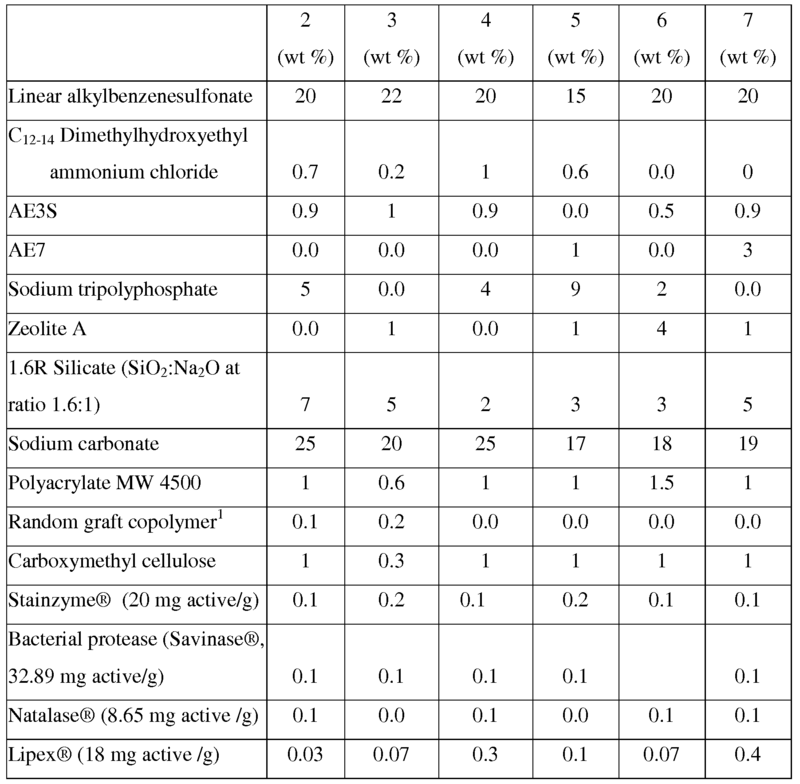 Mycobacterium smegmatis perhydrolase, variants of so-called CE-7 perhydrolases, and variants of wild-type subtilisin Carlsberg possessing perhydrolase activity. Any of the aspects of the concentrated cleaning and/or treatment compositions described in the present specification may comprise a surfactant, including a surfactant selected from the group of anionic surfactants including anionic surfactants selected from the group consisting of linear alkylbenzene- sulfonate (LAS), alcohol ethoxysulfate (AES), mid-branched alkyl sulfates (HSAS) and mixtures thereof; non-ionic surfactants including alcohol ethoxylates, for example alcohol ethoxylates having a chain length of from 1 to 14 carbons, or 12 to 14 carbons; amine oxides and mixtures thereof. Any of the aspects of the concentrated cleaning and/or treatment compositions described in the present specification may comprise a fabric hueing agent selected from the group consisting of direct violet 7 , direct violet 9 , direct violet 11, direct violet 26, direct violet 31, direct violet 35, direct violet 40, direct violet 41, direct violet 51, direct violet 66, direct violet 99, acid violet 50, acid blue 9, acid violet 17, acid black 1, acid red 17, acid blue 29, solvent violet 13, disperse violet 27 disperse violet 26, disperse violet 28, disperse violet 63 and disperse violet 77, basic blue 16, basic blue 65, basic blue 66, basic blue 67, basic blue 71, basic blue 159, basic violet 19, basic violet 35, basic violet 38, basic violet 48; basic blue 3 , basic blue 75, basic blue 95, basic blue 122, basic blue 124, basic blue 141, thiazolium dyes, reactive blue 19, reactive blue 163, reactive blue 182, reactive blue 96, polymeric dyes such as Liquitint® Violet DD (Milliken), Liquitint® Violet CT (Milliken, Spartanburg, USA) and Azo-CM-Cellulose (Megazyme, Bray, Republic of Ireland). Other suitable hueing agents are hueing dye-photobleach conjugates, such as the conjugate of sulphonated zinc phthalocyanine with direct violet 99. A particularly preferred hueing agent is a combination of acid red 52 and acid blue 80, or the combination of direct violet 9 and solvent violet 13, dye-clay conjugates comprising at least one cationic/basic dye and a smectite clay and mixtures thereof. Any of the aspects of the concentrated cleaning and/or treatment compositions described in the present specification may comprise, based on total product weight, from about 0% to about 3%, from about 0.0001% to about 0.5%, or even from about 0.0005% to about 0.3% photobleach and/or from about 0.00003% to about 0.3%, from about 0.00008% to about 0.05%, or even from about 0.0001% to about 0.04% hueing agent. It is understood that any of the aspects of the concentrated cleaning and/or treatment compositions described in the present specification may comprise any combinations of materials and parameters disclosed herein. Thus, the concentrated cleaning and/or treatment compositions described in the present specification may comprise multiple materials, for example, enzymes, surfactants, polymers builders and fabric hueing agents. Enzymes suitable for use in the present cleaning and/or treatment compositions can be obtained from Genencor International, Palo Alto, California, U.S. A; Novozymes A/S, Bagsvaerd, Denmark; Sigma- Aldrich Company Ltd, Dorset, UK; and AB Enzymes, Darmstadt, Germany. Surfactants suitable for use in the present cleaning and/or treatment compositions can be obtained from Stepan, Northfield, Illinois, USA; Huntsman, Salt Lake City, Utah, USA; Procter & Gamble Chemicals, Cincinnati, Ohio, USA. Builders suitable for use in the present cleaning and/or treatment compositions can be obtained from Rhodia, Paris, France; Industrial Zeolite (UK) Ltd, Grays, Essex, UK; Koma, Nestemica, Czech Republic. Polymers suitable for use in the present cleaning and/or treatment compositions can be obtained from BASF, Ludwigshafen, Germany, CP Kelco, Arnhem, Netherlands. Photobleaches suitable for use in the present cleaning and/or treatment compositions can be obtained from Aldrich, Milwaukee, Wisconsin, USA; Frontier Scientific, Logan, Utah, USA; Ciba Specialty Chemicals, Basel, Switzerland; BASF, Ludwigshafen, Germany; Lamberti S.p.A, Gallarate, Italy; Dayglo Color Corporation, Mumbai, India; Organic Dyestuffs Corp., East Providence, Rhode Island, USA. Hueing agents suitable for use in the present cleaning and/or treatment compositions can be obtained from Aldrich, Milwaukee, Wisconsin, USA; Ciba Specialty Chemicals, Basel, Switzerland; BASF, Ludwigshafen, Germany; Dayglo Color Corporation, Mumbai, India; Organic Dyestuffs Corp., East Providence, Rhode Island, USA; Dystar, Frankfurt, Germany; Lanxess, Leverkusen, Germany; Megazyme, Wicklow, Ireland; Clariant, Muttenz, Switzerland. While not essential for the purposes of the present invention, the non-limiting list of adjuncts illustrated hereinafter are suitable for use in the instant compositions and may be desirably incorporated in certain embodiments of the invention, for example to assist or enhance cleaning performance, for treatment of the substrate to be cleaned, or to modify the aesthetics of the cleaning composition as is the case with perfumes, colorants, dyes or the like. Such adjunct are in addition to the materials already disclosed for use in the cleaning and/or treatment compositions described in the present specification. The precise nature of these additional components, and levels of incorporation thereof, will depend on the physical form of the composition and the nature of the cleaning operation for which it is to be used. Suitable adjunct materials include, but are not limited to, additional surfactants, additional builders, additional polymers, additional hueing agents, additional photobleaches, chelating agents, dye transfer inhibiting agents, dispersants, additional enzymes, and enzyme stabilizers, catalytic materials, bleach activators, hydrogen peroxide, sources of hydrogen peroxide, preformed peracids, polymeric dispersing agents, clay soil removal/anti-redeposition agents, brighteners, suds suppressors, dyes, perfumes, structure elasticizing agents, fabric softeners, carriers, hydrotropes, processing aids, solvents, additional hueing agents, structurants and/or pigments. In addition to the disclosure below, suitable examples of such other adjuncts and levels of use are found in U.S. Patent Nos. 5,576,282, 6,306,812 Bl and 6,326,348 Bl that are incorporated by reference. (3) sources of hydrogen peroxide, for example, inorganic perhydrate salts, including alkali metal salts such as sodium salts of perborate (usually mono- or tetra-hydrate), percarbonate, persulphate, perphosphate, persilicate salts and mixtures thereof. In one aspect of the invention the inorganic perhydrate salts are selected from the group consisting of sodium salts of perborate, percarbonate and mixtures thereof. When employed, inorganic perhydrate salts are typically present in amounts of from 0.05 to 40 wt%, or 1 to 30 wt% of the overall concentrated composition and are typically incorporated into such compositions as a crystalline solid that may be coated. Suitable coatings include, inorganic salts such as alkali metal silicate, carbonate or borate salts or mixtures thereof, or organic materials such as water-soluble or dispersible polymers, waxes, oils or fatty soaps; and (4) bleach activators having R-(C=0)-L wherein R is an alkyl group, optionally branched, having, when the bleach activator is hydrophobic, from 6 to 14 carbon atoms, or from 8 to 12 carbon atoms and, when the bleach activator is hydrophilic, less than 6 carbon atoms or even less than 4 carbon atoms; and L is leaving group. Examples of suitable leaving groups are benzoic acid and derivatives thereof - especially benzene sulphonate. Suitable bleach activators include dodecanoyl oxybenzene sulphonate, decanoyl oxybenzene sulphonate, decanoyl oxybenzoic acid or salts thereof, 3,5,5-trimethyl hexanoyloxybenzene sulphonate, tetraacetyl ethylene diamine (TAED) and nonanoyloxybenzene sulphonate (NOBS). Suitable bleach activators are also disclosed in WO 98/17767. While any suitable bleach activator may be employed, in one aspect of the invention the subject cleaning composition may comprise NOBS, TAED or mixtures thereof. (sulfooxy)propyl]isoquinolinium, inner salt; 2-[3-[(2-ethylhexyl)oxy]-2-(sulfooxy)propyl]-3,4- dihydroisoquinolinium, inner salt and mixtures thereof. As a practical matter, and not by way of limitation, the compositions and cleaning processes herein can be adjusted to provide on the order of at least 0.001 ppm of booster in the washing medium, from about 0.001 ppm to about 500 ppm, from about 0.005 ppm to about 150 ppm, or even from about 0.05 ppm to about 50 ppm, of booster in the wash liquor. In order to obtain such levels in the wash liquor, typical compositions herein will comprise from about 0.0002% to about 5%, from about 0.001% to about 1.5%, of booster, by weight of the cleaning compositions. When present, the peracid and/or bleach activator is generally present in the concentrated composition in an amount of from about 0.1 to about 60 wt%, from about 0.5 to about 40 wt % or even from about 0.6 to about 10 wt% based on the composition. One or more hydrophobic peracids or precursors thereof may be used in combination with one or more hydrophilic peracid or precursor thereof. The amounts of hydrogen peroxide source and peracid or bleach activator may be selected such that the molar ratio of available oxygen (from the peroxide source) to peracid is from 1 : 1 to 35:1, or even 2:1 to 10:1. Surfactants - The concentrated cleaning compositions according to the present invention may comprise a surfactant or surfactant system wherein the surfactant can be selected from nonionic surfactants, anionic surfactants, cationic surfactants, ampholytic surfactants, zwitterionic surfactants, semi-polar nonionic surfactants and mixtures thereof. When present, surfactant is typically present at a level of from about 0.1% to about 60%, from about 1% to about 50% or even from about 5% to about 40% by weight of the subject composition. Builders - The concentrated cleaning compositions of the present invention may comprise one or more detergent builders or builder systems. Builders include, but are not limited to, the alkali metal, ammonium and alkanolammonium salts of polyphosphates, alkali metal silicates, alkaline earth and alkali metal carbonates, aluminosilicate builders and polycarboxylate compounds, ether hydroxypolycarboxylates, copolymers of maleic anhydride with ethylene or vinyl methyl ether, 1, 3, 5-trihydroxy benzene-2, 4, 6-trisulphonic acid, and carboxymethyloxysuccinic acid, the various alkali metal, ammonium and substituted ammonium salts of polyacetic acids such as ethylenediamine tetraacetic acid and nitrilotriacetic acid, as well as polycarboxylates such as mellitic acid, succinic acid, citric acid, oxydisuccinic acid, polymaleic acid, benzene 1,3,5-tricarboxylic acid, carboxymethyloxysuccinic acid, and soluble salts thereof. Chelating Agents - The concentrated cleaning compositions herein may contain a chelating agent. Suitable chelating agents include copper, iron and/or manganese chelating agents and mixtures thereof. When a chelating agent is used, the subject composition may comprise from about 0.005% to about 15% or even from about 3.0% to about 10% chelating agent by weight of the subject composition. Dye Transfer Inhibiting Agents - The concentrated cleaning compositions of the present invention may also include one or more dye transfer inhibiting agents. Suitable polymeric dye transfer inhibiting agents include, but are not limited to, polyvinylpyrrolidone polymers, polyamine N-oxide polymers, copolymers of N-vinylpyrrolidone and N-vinylimidazole, polyvinyloxazolidones and polyvinylimidazoles or mixtures thereof. When present in a subject composition, the dye transfer inhibiting agents may be present at levels from about 0.0001% to about 10%, from about 0.01% to about 5% or even from about 0.1% to about 3% by weight of the composition. Brighteners - The concentrated cleaning compositions of the present invention can also contain additional components that may tint articles being cleaned, such as fluorescent brighteners. 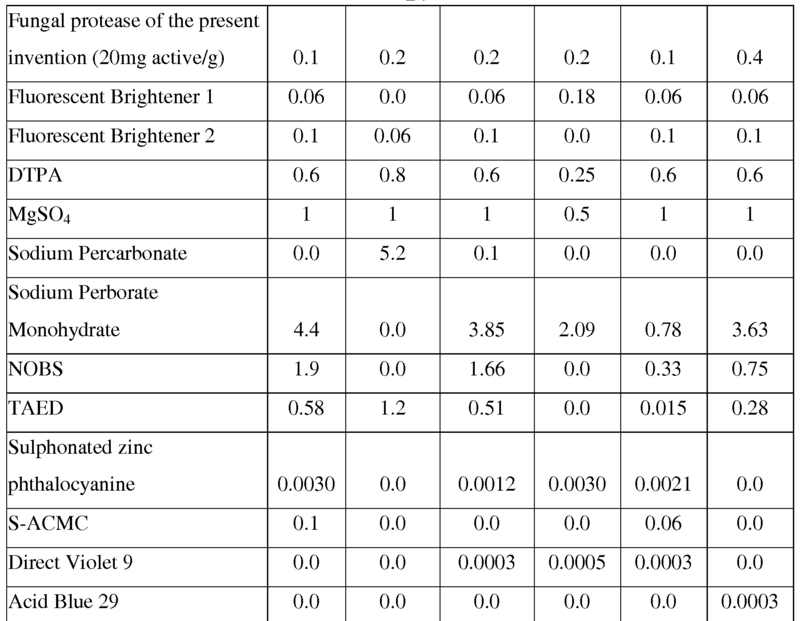 Suitable fluorescent brightener levels include lower levels of from about 0.01, from about 0.05, from about 0.1 or even from about 0.2 wt % to upper levels of 0.5 or even 0.75 wt %. Dispersants - The concentrated compositions of the present invention can also contain dispersants. Suitable water-soluble organic materials include the homo- or co-polymeric acids or their salts, in which the polycarboxylic acid comprises at least two carboxyl radicals separated from each other by not more than two carbon atoms. Enzymes - The concentrated cleaning compositions can comprise one or more enzymes which provide cleaning performance and/or fabric care benefits. Examples of suitable enzymes include, but are not limited to, hemicellulases, peroxidases, proteases, cellulases, xylanases, lipases, phospholipases, esterases, cutinases, pectinases, mannanases, pectate lyases, keratinases, reductases, oxidases, phenoloxidases, lipoxygenases, ligninases, pullulanases, tannases, pentosanases, glucanases, arabinosidases, hyaluronidase, chondroitinase, laccase, amylases, or mixtures thereof. A typical combination is an enzyme cocktail that may comprise, for example, a protease and lipase in conjunction with amylase. When present in a cleaning composition, the aforementioned additional enzymes may be present at levels from about 0.00001% to about 2%, from about 0.0001% to about 1% or even from about 0.001% to about 0.5% enzyme protein by weight of the composition. Enzyme Stabilizers - Enzymes for use in detergents can be stabilized by various techniques. The enzymes employed herein can be stabilized by the presence of water-soluble sources of calcium and/or magnesium ions in the finished compositions that provide such ions to the enzymes. In case of aqueous compositions comprising protease, a reversible protease inhibitor, such as a boron compound, for example, 4-formyl-phenylboronic acid can be added to further improve stability. Catalytic Metal Complexes - Applicants' concentrated cleaning compositions may include catalytic metal complexes. One type of metal-containing bleach catalyst is a catalyst system comprising a transition metal cation of defined bleach catalytic activity, such as copper, iron, titanium, ruthenium, tungsten, molybdenum, or manganese cations, an auxiliary metal cation having little or no bleach catalytic activity, such as zinc or aluminum cations, and a sequestrate having defined stability constants for the catalytic and auxiliary metal cations, particularly ethylenediaminetetraacetic acid, ethylenediaminetetra(methylenephosphonic acid) and water-soluble salts thereof. Such catalysts are disclosed in U.S. 4,430,243. If desired, the concentrated compositions herein can be catalyzed by means of a manganese compound. Such compounds and levels of use are well known in the art and include, for example, the manganese-based catalysts disclosed in U.S. 5,576,282. Cobalt bleach catalysts useful herein are known, and are described, for example, in U.S. 5,597,936; U.S. 5,595,967. Such cobalt catalysts are readily prepared by known procedures, such as taught for example in U.S. 5,597,936, and U.S. 5,595,967. Compositions herein may also suitably include a transition metal complex of ligands such as bispidones (WO 05/042532 Al) and/or macropolycyclic rigid ligands - abbreviated as "MRLs". As a practical matter, and not by way of limitation, the compositions and processes herein can be adjusted to provide on the order of at least one part per hundred million of the active MRL species in the aqueous washing medium, and will typically provide from about 0.005 ppm to about 25 ppm, from about 0.05 ppm to about 10 ppm, or even from about 0.1 ppm to about 5 ppm, of the MRL in the wash liquor. Suitable transition-metals in the instant transition-metal bleach catalyst include, for example, manganese, iron and chromium. Suitable MRLs include 5,12-diethyl-l,5,8,12- tetraazabicyclo[6.6.2]hexadecane. Suitable transition metal MRLs are readily prepared by known procedures, such as taught for example in WO 00/32601, and U.S. 6,225,464. Solvents - Suitable solvents include water and other solvents such as lipophilic fluids. Examples of suitable lipophilic fluids include siloxanes, other silicones, hydrocarbons, glycol ethers, glycerine derivatives such as glycerine ethers, perfluorinated amines, perfluorinated and hydrofluoroether solvents, low-volatility nonfluorinated organic solvents, diol solvents, other environmentally-friendly solvents and mixtures thereof. The compositions of the present invention can be formulated into any suitable form and prepared by any process chosen by the formulator, non-limiting examples of which are described in Applicants' examples and in U.S. 4,990,280; U.S. 20030087791A1; U.S. 20030087790A1; and U.S. 20050003983A1. The present invention includes a method for cleaning a surface comprising a first step of contacting said surface with a concentrated cleaning composition comprising a fungal serine protease; and a second step wherein the concentrated cleaning composition is diluted to form an aqueous wash liquor and the surface undergoes a washing step in the aqueous wash liquor. After washing in the aqueous wash liquor, the method may include optionally rinsing and optionally drying such surface. A preferred surface comprises a textile or fabric. For purposes of the present invention, washing includes but is not limited to, scrubbing, and mechanical agitation. Drying of such surfaces or fabrics may be accomplished by any one of the common means employed either in domestic or industrial settings. Such means include but are not limited to forced air or still air drying at ambient or elevated temperatures at pressures between 5 and 0.01 atmospheres in the presence or absence of electromagnetic radiation, including sunlight, infrared, ultraviolet and microwave irradiation. In one aspect, said drying may be accomplished at temperatures above ambient by employing an iron wherein, for example, said fabric may be in direct contact with said iron for relatively short or even extended periods of time and wherein pressure may be exerted beyond that otherwise normally present due to gravitational force. In another aspect, said drying may be accomplished at temperatures above ambient by employing a dryer. Apparatus for drying fabric is well known and it is frequently referred to as a clothes dryer. In addition to clothes such appliances are used to dry many other items including towels, sheets, pillowcases, diapers and so forth and such equipment has been accepted as a standard convenience in many nations of the world substantially replacing the use of clothes lines for drying of fabric. Most dryers in use today use heated air which is passed over and or through the fabric as it is tumbled within the dryer. The air may be heated, for example, either electronically, via gas flame, or even with microwave radiation. Such air may be heated from about 15°C to about 400°C, from about 25°C to about 200°C, from about 35°C to about 100°C, or even from about 40°C to about 85 °C and used in the dryer to dry a surface and/or a fabric. Without being bound by theory, it is believed that additional bleaching may be obtained from organic catalyst remaining on the surface or fabric during and/or after drying thus it may be advantageous to dry said surface or fabric. As will be appreciated by one skilled in the art, the cleaning compositions of the present invention are ideally suited for use in laundry applications. Accordingly, the present invention includes a method for laundering a fabric. The method comprises the steps of contacting a fabric to be laundered with a said cleaning laundry solution comprising at least one embodiment of Applicants' cleaning composition, cleaning additive or mixture thereof. The fabric may comprise most any fabric capable of being laundered in normal consumer use conditions. The solution typically has a pH of from about 7 to about 10.5, though lower pHs are also suitable, for example below 7. In the first step, the surface is contacted with the concentrated cleaning and/or treatment composition for example in a pretreatment step by direct application to the surface and particularly to any stain on the surface. Application to grass stains may be particularly useful. Alternatively, the concentrated cleaning and/or treatment composition may be placed into a washing machine and the surface to be contacted placed in proximity so that movement of the machine results in the concentrated cleaning and/or treatment composition contacting the surface. Contact in the first step is typically at least 5 or 10 or 20 or 30 seconds, or may be at least 1 minute or 90 seconds or 2 or 3 or 4 minutes prior to dilution or contact with water. The second step in which the cleaning and/or treatment composition is diluted with water to form an aqueous wash liquor may comprise adding the surface with concentrated cleaning and/or treatment composition directly into water, or by addition of water into a machine comprising the surface already in contact with the concentrated cleaning and/or treatment composition. The concentrated cleaning and/or treatment composition may be contacted in the first step at concentrations from above about 15,000, preferably at least 20,000, or at least 30,000 or at least 50,000 or even at least 100,000 ppm or 200,000 ppm up to 100 wt or 98 or 95wt concentrated cleaning composition wherein all or 98 or 95 wt of the cleaning composition comprises active cleaning component. The water temperatures in the second step typically range from about 5 °C to about 90 °C. The water to fabric ratio in the second step is typically from about 1: 1 to about 30: 1. Additional cleaning and/or treatment may be added into the second step. Thus, in one aspect, a method of treating and/or cleaning a surface or fabric comprising the steps of optionally washing and/or rinsing said surface or fabric, contacting said surface or fabric with any cleaning and/or treatment composition disclosed herein, then optionally washing and/or rinsing said surface and/or fabric then optionally letting drying said surface or fabric dry and/or actively drying said surface or fabric, is disclosed. Unless otherwise indicated, materials can be obtained from Aldrich, P.O. Box 2060, Milwaukee, WI 53201, USA. chromatography and gel filtration. During anion exchange chromatography (pH 8) one peak is detected in the eluted fractions. The fractions showing activity on benzoyl-arginyl-p-nitroanilide are pooled, concentrated by ultrafiltration and subjected to size exclusion chromatography. About 95% purity is achieved with ion exchange separation and a subsequent gel filtration step. Granular laundry detergent compositions designed for hand washing or top-loading washing machines may be added to sufficient water to form a paste for direct contact with the surface to be treated, forming a concentrated cleaning compostion. Granular laundry detergent compositions designed for front- loading automatic washing machines may be added to sufficient water to form a paste for direct contact with the surface to be treated, forming a concentrated cleaning compostion. Any of the above compositions is used to launder fabrics in the second step at a concentration of 7000 to 10000 ppm in water, 20-90 °C, and a 5: 1 watencloth ratio. The typical pH is about 10. The fabrics are then dried. In one aspect, the fabrics are actively dried using a dryer. In one aspect, the fabrics are actively dried using an iron. In another aspect, the fabrics are merely allowed to dry on a line wherein they are exposed to air and optionally sunlight. This composition may be enclosed in a polyvinyl alcohol pouch. * Based on total cleaning and/or treatment composition weight, a total of no more than 7% water 1 Random graft copolymer is a polyvinyl acetate grafted polyethylene oxide copolymer having a polyethylene oxide backbone and multiple polyvinyl acetate side chains. The molecular weight of the polyethylene oxide backbone is about 6000 and the weight ratio of the polyethylene oxide to polyvinyl acetate is about 40 to 60 and no more than 1 grafting point per 50 ethylene oxide units. 2 Polyethyleneimine (MW = 600) with 20 ethoxylate groups per -NH. Whitezyme® are all products of Novozymes, Bagsvaerd, Denmark. S-ACMC is carboxymethylcellulose conjugated with C.I. Reactive Blue 19, sold by Megazyme, Wicklow, Ireland under the product name AZO-CM-CELLULOSE, product code S- ACMC. 1. A method for cleaning a surface comprising a first step of contacting said surface with a concentrated cleaning composition comprising a fungal serine protease; and a second step wherein the concentrated cleaning composition is diluted to form an aqueous wash liquor. 2. A method according to claim 1 wherein the concentrated cleaning composition comprises greater than 15000 ppm active cleaning component, preferably greater than 15500 ppm, more preferably greater than 50000 ppm. 3. A method according to claim 1 or claim 2 wherein the surface is a textile surface. 4. A method according to any preceding claim wherein the surface is contacted with the concentrated cleaning composition for at least one minute prior to the second, dilution step. vi) fungal serine protease having at least 81%, 85%, 90%, 95%, 99%, or even complete identity to SEQ ID NO: 6; and mixtures thereof. 6. A method according to any preceding claim wherein the composition comprises additional enzyme comprises a mannanase. 7. A method according to any preceding claim wherein the composition comprises an additional enzyme comprising an amylase. 8. A method according to any preceding claim wherein the concentrated cleaning and/or treatment composition comprises less than 70wt% free water, preferably less than 50 wt% free water. 9. A method according to any preceding claim wherein the concentrated cleaning composition comprises a polymer selected from polyethyleneimines and substituted polyethyleneimines . 10. A method according to any preceding claim wherein the concentrated cleaning composition is contacted with the surface inside the drum of a washing machine. 11. A method according to any preceding claim, wherein said concentrated cleaning and/or treatment composition is a hand dishwashing or machine dishwashing composition. 12. A method according to any preceding claim wherein said concentrated cleaning and/or treatment composition comprises, based on total cleaning and/or treatment composition weight, a total of no more than 20% water. 13. A method according to any preceding claim wherein said concentrated cleaning and/or treatment composition comprises, based on total cleaning and/or treatment composition weight, from 10% to 70% of a water-miscible organic solvent having a molecular weight of greater than 70 Daltons. 14. A method according to any preceding claim wherein said concentrated cleaning and/or treatment composition comprises a perfume microcapsule comprising a core and a shell that encapsulates said core, said perfume microcapsule having a D[4,3] average particle of from 0.01 microns to 200 microns. ES2363788T3 (en) 2011-08-16 detergent compositions.